When you’re a recent grad with a miniscule income, a sublet apartment, and no bills in your name, convincing credit card companies to throw you a bone isn’t always easy. Combine those stacked odds with the fact that it takes an advanced math degree to understand APRs, and getting plastic can become a long, drawn-out affair. Given the popularity of Second Life and the developing problem of slave laborers who collect virtual gold in videogames to sell on eBay, this card should not really come as a surprise—just another example of the commodification of online worlds, right? Still, the notion of making real-life purchases to earn extra time in your alternate life as “Glong, the war wizard of the troll hobbit” still strikes me as slightly insane. The Capital One “Card Lab” allows you customize various features and rewards. Pretty good idea, and not necessarily absurd. 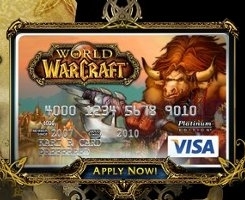 However, the freedom to upload a photo and put it on your credit card could clearly be misused. It seems kind of cool to have a picture of your girlfriend naked on your card when you’re shopping on eBay, but then you take her out to dinner and it becomes a questionable choice. The Kentucky Derby evokes images of blue-blooded aristocracy, mint juleps, and horses with ridiculous names. Credit cards fit nicely into this world. But who likes horseracing so much that they want to exclusively earn rewards on equestrian merchandise and gambling credits? An utter lunatic, that’s who. Similar to the Derby card if you replace the mint julep purchases with Bud Heavies. You can also get Indianapolis Motor Speedway and NASCAR cards (NASCARds! ), all of which make me feel slightly alienated from the country in which I live. Discounts at 7-11? Sounds great! Too bad the your pot dealer doesn't accept plastic—the “munchies” would essentially be on the house! According to its website, Mack’s Prairie Wings is “America’s Premier Waterfowl Outfitter.” So definitely get this card if you are planning to hunt your own Thanksgiving turkey and teach your dog to chase ducks out of undergrowth. I don't even know what the rewards are on the infamous “Black Card,” but apparently it allows you to “buy anything.“ Combine the allure of omnipotent spending with the fact that it's name-checked in almost as many rap songs as Cristal, and it begins to sound like a “must-have” item. Then you realize that you have the spend three months of rent ($2,500) just for the privilege of using it. Oh well. Bonus: Casino Cards. Many non-Trump-affiliated casinos and resorts offer cards, such as the Total Rewards Visa by Harrah’s. This system makes sense to me—if you think of credit card rewards as “free money” (perhaps the wrong approach), then why not just gamble them away immediately?